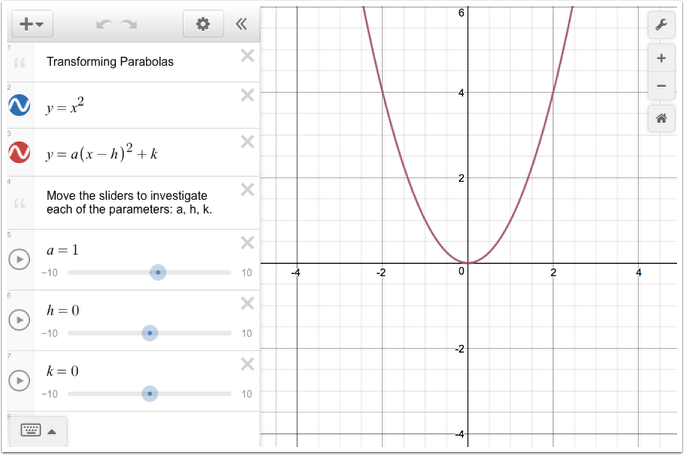 Use this eTool to support a class discussion about the equation y = a(x − h)2 + k.
Identify which parameter (a, h, or k) affects the orientation, vertical shift, horizontal shift, vertical stretch, and vertical compression of the graph compared to the graph of the parent function y = x2. What values stretch the graph vertically? Compress the graph vertically? Why do those values have these impacts? What values cause the graph to flip vertically? What values cause the graph to shift to the left? To the right? Why? What values cause the graph to shift up or down? Why? Are there points on your graph that connect to specific parameters in the equation? Explain. Use the sliders to change the parameters. 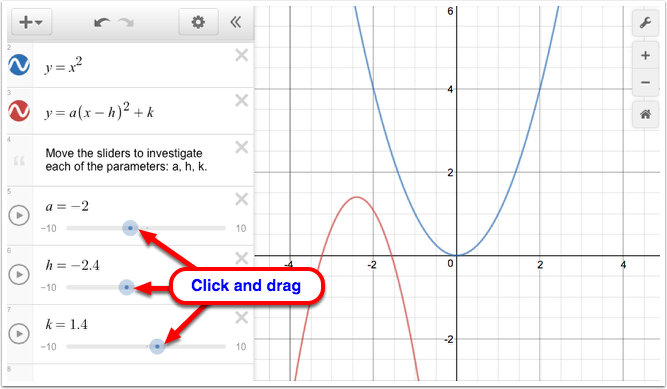 Click the blue points on the sliders and drag (horizontally) to change the parameters.